The two sockets that blacksmiths are allowed to add to their gear serve for a very practical raiding advantage. The socket type is colorless, meaning that any gem of any color will match the socket. This makes Blacksmith very alluring to any class or player. 2 extra sockets means two extra Solid Ocean Sapphire@ +60 stamina. This means that Blacksmithing give +120 stamina to raids that level their skill up. The true advantage of blacksmithing comes from the ability to recustomize your gear. A paladin tank with blacksmithing gains the same amount of bonus stamina as a paladin tank with Mining's . Yet now our paladin tank wants to re-spec to Retrabution. In his Ret gear he will adds +80 to Strength via two Bold Inferno Ruby. Now instead of +120 stamina, which is only useful for survivability, our Blacksmithing paladin has an extra DPS boost. Blacksmiths mesh very well with Jewelcrafters because a blacksmith has access to 2 additional colorless sockets, for a total of 3 colorless sockets with a belt buckle.Jewelcrafters need to put their 3 JC gems in their gear. While the gems can be put in any socket, always putting these gems in your colorless sockets makes switching gear is never a problem. When you replace gear, you will always be at 3 dragon's eyes and never worry about being over or under the limit. Just thought I'd put up a quick list of Northrend blacksmithing plans that you do not learn straight from the trainers. All need 450 skill to learn. Most, with the exception of the first, are associated with a certain raid (Ulduar, Trial of the Crusader, or Icecrown Citadel) and have an associated crafting item (Runed Orb, Crusader Orb, or Primordial Saronite respectively). All are plate except for the shield enchant. Also, keep in mind that you are probably going to be getting most of these off the Auction House for anywhere between 500g and 1000g a pop. Plans: Titanium Plating (Alliance version): Requires Exalted status with either the Horde Expedition or the Alliance Vanguard. Can be bought for 15g from faction quartermasters in the Howling Fjord (Horde/Alliance) or Borean Tundra (Horde/Alliance). Cannot be bought or sold on the Auction House as they are BOP. I think that covers it. Good luck and happy crafting! Want to read about your profession? The blacksmithing specializations are relics from vanilla and TBC, so don't worry about it. Will they be bringing armorsmithing and weaponsmithing back in cataclysm? Skilling from 450 to 525! This is pretty hard if your not a miner.. i had 1300 of every wotlk ores, primals and good amount of gold before Cata. Did get to 479 with those mats. Grind alot and craft many at the same time! With the Cata mats, i grinded near 1100 Elementium Ores around 290 Pyrite Ore and approx 164 Obsidium Ore and 80 different Volatile's. Took me around 2 days to skill max, had Engi and BS so was hard to skill anything without any gathering. All of these ores are needed to skill and to get the recipes from vendor. This Ebonsteel Belt Buckle isnt worth that amount. Blizzard should have tweaked this abit, 1 more slot or if you socketing gloves and wrist you you get a socket bonus..
To be able to skill to higher than 510 and to be able to get those recepies, you need to be 84! Or else you wont get the questchain that takes you to twilight highlands to unlock the vendors in dragonmaw port. It seems to me that BS is the only profession that is like this, or did i miss something? Can someone tell me why you'd bother to skill up BS past 410 or whatever it is once you can obtain socket bracer/gloves? BS has always been a money sink anyway, but I'm able to socket cata gems into my gloves/bracers at 425 BS. And I can't see any reason to invest gold into the profession as it's such a money loser. Am I missing something obvious here? Does BS provide some other benefit to justify the further skilling up? I hope they add more recipes in Cata. It's kinda sad, that they put out the specializations, they could have been remained as achievements, or/and bonus giver, for example, if you are an armorsmith, you have 25% chance to gain extra skill point, or to get get back some minerals after the armor making process. Professions could probably have been done better. I suspect though that blizz is reacting at least in part to player feedback. Some players don't like specializations - because they don't like being restricted, and they want things to be easy. According to ARL, the Light Skyforged Axe is learnable from trainers, but none of the trainers I've checked seem to have it. It seems to have been a Weaponsmith specialization thing. I thought all the specialty items were made generally trainable by any blacksmith when specializations went the way of the dodo. Is this thing still in the game? Check other proffessions for my suggestions on who should have which. Now with the arrival of the Cataclysm, we have 9 new recipes so far. There are also several other items, with more amount of PVP items. I was kind of hoping there would be a decent pattern for shoulders w/o resilience. I have no problem keeping the current craftable shoulders but would like a second option with a more warrior oriented stat. I've always wondered why Blacksmiths cant repair gear. If they can make it shouldnt they be able to repair it? Just saying it would make my life alot more easier if i didnt have to look for someone to fix my gear when my dungeon group sucked e.e stupid healers. Maybe i am wrong, but i think thak blacksmithing is somehow forgotten by Blizzard. The other craftsmen like engineers, alchemist, leatherworkers got a lot of crafts, that they can sell for a very big price, (like chopper, alchemy mount, flasks, bags, cloaks, enchants), and also they got their own special traits, like jeeves, engineering socket, trinkets, prismatic gems, etc. We blacksmiths got two professonrequired socket, and the belt buckets, of course, some low level shield and weapon enchant, but that's all. I'm not whining, do not misunderstand, but we could get more unique abilites, like PrinceOshen mentioned before self repair, or self enchant for plates and weapons. I like tradeskills and have most to 500+ today but i would love for more low level gear, say shields that does not exist prior to 70 i think, more caster oriented weapons/armor for low levels would be nice to, at 30 my holy paladin is lacking int badly, and why can't we craft staffs or bows. Currently, my Blacksmith is at Level 475, but the trainer(s) have not provided training to make most of the items which are listed for Blacksmithing Level 425 in the table on this page. Training for at least some of those items, if not all, are available at a higher level(s). As far as I can determine, making any item which requires Elementium is trained at Level 480 or higher. I do not know when Blizzard changed the skill levels for making any of the items and/or changed anything else about them. Sorry if this may have been asked, but with the coming of 4.0.3 & the removal of the specializations, where would a blacksmith learn the old recipes that were part of the specializations? Good news everyone! I spent an afternoon organizing Blacksmithing sets and pseudo sets without any true guidelines! I'd use those as a base to export them and match with other armor pieces, maybe even give me a good ol' beating showing me HOW to organize the sets (and pseudo-sets) for the new Transmogrification thing that should be coming in 4.3. Here They Seem To Be Found. who also give access to some Ring, Trinket, Neck and other items. Since im in a level 25 Guild i get which is obtained with a level 24 Guild. Vendor price on items is 27 Gold+ less with the Guild Perk. Blacksmiting Plans are now at 210 Gold which is 90 Gold cheaper. BS has become useless other than the fact that they make belt buckles and the two sockets. I hope Blizzard makes changes to this profession to increase its appeal. - Firstly the easiest, craft for others, asking a small fee. This is by far the worst way, but occasionally you may find the guy who's in a rush and he's willing to pay. 10 g for a click is not bad. 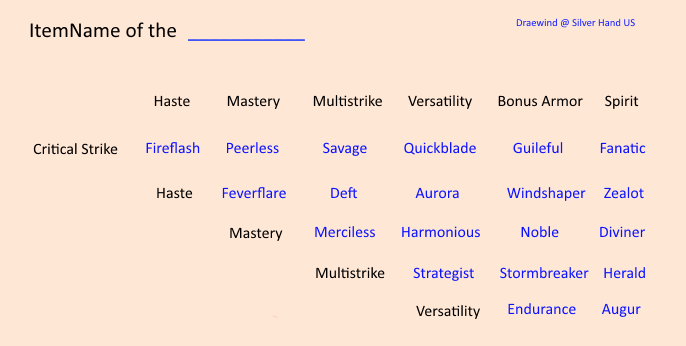 I was wondering if there is any way to make Dragonstrike now that the specializations are gone. Thanks in advance! So after a certain skill level I guess Blacksmiths "forget" how to make mail armor. I wish I would have known this BEFORE leveling Blacksmithing to 375. In my opinion, I think it's retarded for Leatherworkers to be able to make mail armor after a certain skill level but not Blacksmiths. Seriously, how does a leatherworker turn 12 Borean Leather into a mail armor? Sorry for the rant, I am sure there will be several replies flaming me, but it just irks me is all. So... where's the information? Does this have anything to do with the website going down earlier? We should be able to repair our own gear. I immediately assumed we could when I was a noob. is it possible 2 unlearn blacksmithing? For those Blacksmithing / Miners who don't want to go to the auction house to buy your leather, by Fishing up a chest (at high skill 225 and above so as to recieve the Fish Finder ability) there is a high probability the chest will contain leather (usually medium to heavy leather). For me, fishing along the Westfall shore and river separating Westfall and Duskwood, 10 out of 15 Fishing sites gave me a trunk/chest, 5 out of 10 chests contained leather, 3 of which contained multiple pieces of medium leather (I have never found light leather this way), and 9 out of 10 contained silver coins. You must cast within the circle of fish. Keep casting untill it falls within the ripple in the water above the fish; appx 4 foot diameter. Fishing seems to be a great secondary skill for a Mining/Blacksmith and you'll make a few coin in the process. Also this will help Starter Edition players get leather since they cannot sell, auction, or trade; and NO creature will drop leather to a player if they are a Mining/Blacksmith. The anvil in Dalaran no longer seems to work for BS. It may be because it is now an enchanted anvil. Because Hellfire Peninsula is essentially a bottleneck for both factions, you might find Fel Iron nodes in extremely short supply when you get to HFP. The good news is, however, that you only need to get Blacksmithing up to 350 to be able to start making Northrend/WotLK recipes (Cobalt), and there is a an Old World recipe that can get you up to 330 - Thorium Leggings. My recommendation here is to spend the extra time in the Old World, farming up Thorium until you get up to 330. That way, you can decrease the need to farm up highly-contested Fel Iron and Adamantite in order to move in. Mining shouldn't be a problem, since you need to tap far fewer nodes than you need to harvest to get Blacksmithing up to the same level. Take it from someone who did it the hard way, and spent hours flying circles around Outland, only to find the occasional node, and the less-than-occasional other player tapping them. Apparently, you can currently get to blacksmithing 500 by using 3239 Ghost Iron Bar. That is 162 stacks. 324 stacks of Ghost Iron Ore.
Haven't tested it, and I wouldn't want to if the prices in the AH are as high as they currently are. I'd prefer flying around the old regions, gathering ore.
CONGRATULATIONS! At this point you should be at skill lvl 500. Don't forget to upgrade blacksmithing and continue on with the regular recipes. The total amount of bars needed for this guide amounts to 4412 or 8824 ore. Good Luck! I dropped Blacksmithing during Burning Crusade and had alot of old world recipes. I want to pick it up again and was wondering if Blizz will give back those recipes and /or the skill level I was at? I play on a private server and there blacksmithing items are worth like 100k gold. If you want a good tanking item, they ask you to give them 100k or more gold. This is outrageous. How on earth am i going to earn that much gold. I think that creators should add some BoE mounts and companions for blacksmithing profession . I am interested to see what potential changes will be coming to this profession once warlords hits. Fewer items can be enchanted, and the goal is to have enchants feel like a bonus instead of something mandatory. Meta gems and socket bonuses are removed. Many fewer items will have sockets in Warlords of Draenor. Either the sockets that blacksmithing gets will be more important... or what they would be removed? Theory here, but if fewer items will have sockets, and they leave the sockets in the profession, wouldnt that just make more people want to take blacksmithing, making it feel more mandatory? For those who wonder, u can combine the ''classic'' way of leveling with the ''Training Projects'' way( if u are 90 level).For example if u dont have enough Fel Iron or Cobalt u can go to shrine and learn the training project with ghost iron bars. The thing is, u have to go again to another trainer to learn next recipes if u wish to continue with classic way. The starting quest item for each crafting profession, skill 600-700, is dropped by Dorogg the Ruthless when doing the quest "The Butcher of Bladespire" at Bladespire Fortress. Choose Blacksmithing and Mining for optimal profit. Would anyone with access to legion be able to give some more details as to how Blacksmith with work, some of the perks/bonus that will be given and maybe the amount of time spent to level the profession. Additionally, will it be worth keeping two crafting professions, or will you need a gathering profession for this expansion. Once you have completed the Blacksmithing questline in Legion, you can acquire the rest of the Demonsteel recipes from Urael. He is a Demon, and is found to the south-west of Meredil in Suramar, at the co-ordinates (30, 53). With the introduction of plate wearing for low level warriors and palas, why are there no corresponding low lvl plate makes in blacksmithing? On my leatherworker I have a whole series of new mail makes for low lvl mail wearers with +agi or +int stats for hunters and shaman. All the mail items I can make with blacksmithing have been changed from +str to +agi for the hunters and shammys to wear so as a warrior I can't even use any of those as an alternative until I can get hold of some plate. World plate drops don't start until lvl 40, I haven't seen any lower lvl plate for sale on the auction house. Are quest rewards now the only way to get low lvl plate? Have I missed something here? Any other low lvl warriors or palas can give me some advice? So it seems. No one here (the respectable Blacksmiths) has mentioned anything about leveling BS from 775 to 800. Which as a 10 year old BS as myself (I'm not 10 LoL, been a BS since TBC), these 25 skill points left are the worst. The only things that are orange, are the legendary item and the mount, and both can only be learnt at 800 (thanks Blizzard for being beyond ridiculous). The entire demonsteel set is green, and I dont think its logic to attempt throwing all those mats for a proc every 4-6. Does any BS oldie have any suggestions ? Would Blacksmithing be a good fit (along with Mining) for my Survival Hunter, since Survival Hunters use melee weapons? I didn't play during Legion and am trying to level Legion BS post BFA. It does not show the skill level in the hundreds that I am seeing on comments. I am at skill 78/100 and am trying to get to 100 so I can learn the Fel Core Hound Harness recipe. All the demonsteel items are green. The only thing that is orange for me is the Empyrial items which take a lot of Primal Sargerite. Is there an easier way to level post BFA? Edit: Nevermind. I realized that learning rank two and three brought it back to orange and now gives 3 item levels per item crafted.